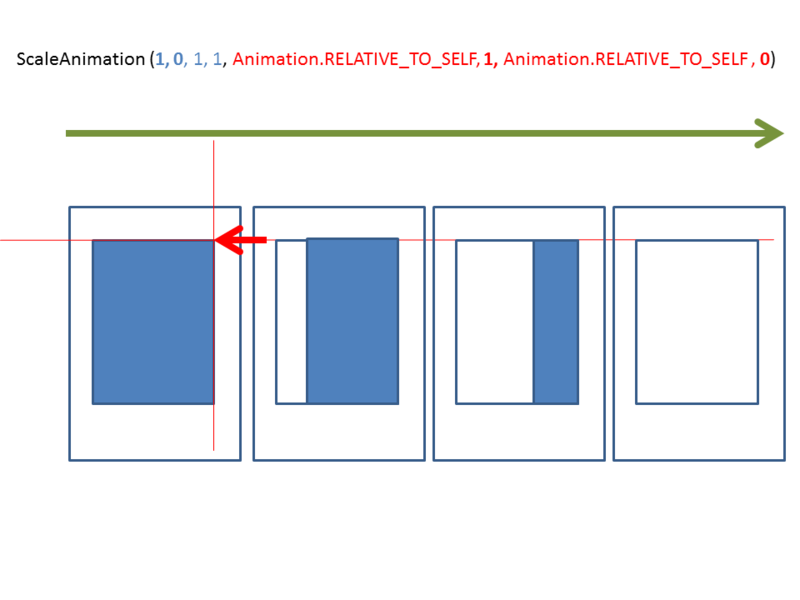 Scale Animation is basically to increase or decrease the size of the View. 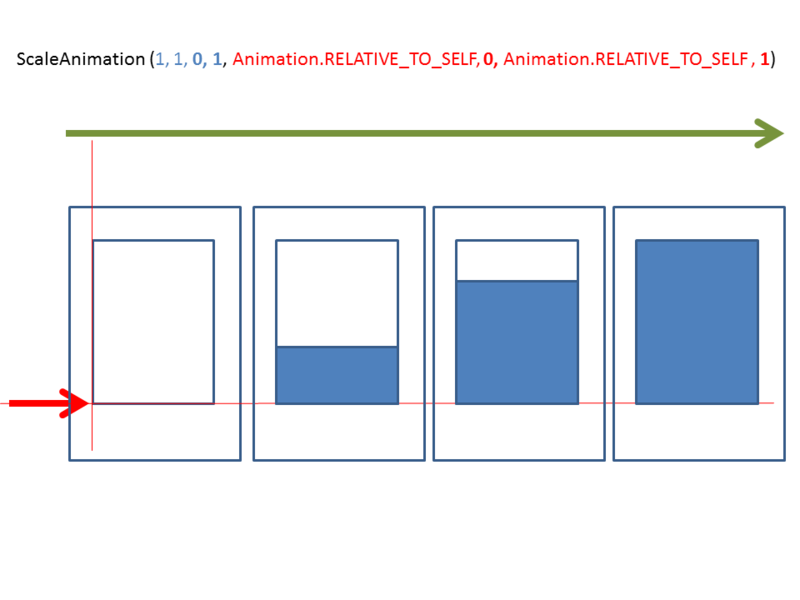 pivotXType Specifies how pivotXValue should be interpreted. 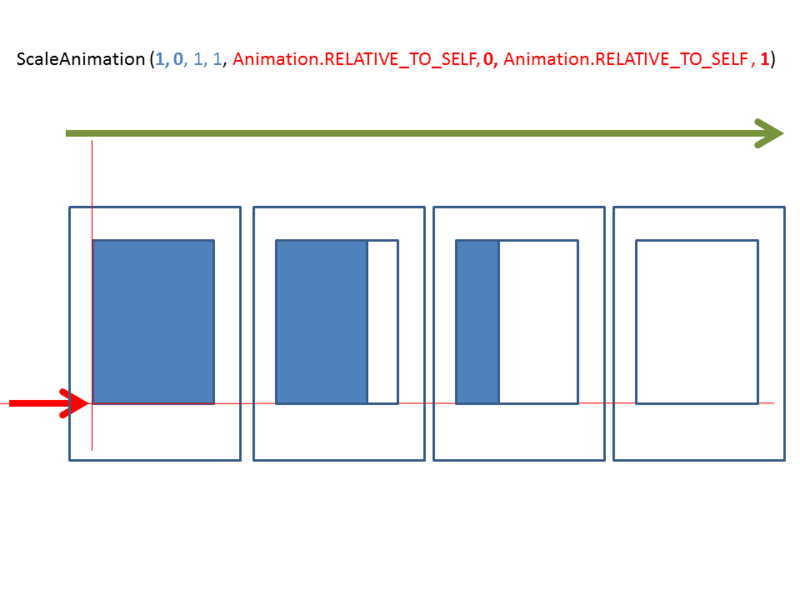 One of Animation.ABSOLUTE, Animation.RELATIVE_TO_SELF, or Animation.RELATIVE_TO_PARENT. 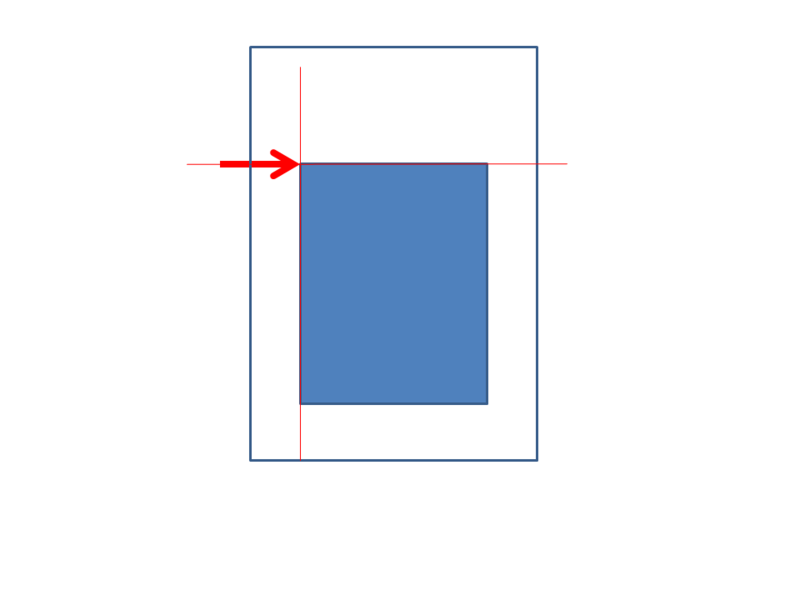 pivotXValue The X coordinate of the point about which the object is being scaled, specified as an absolute number where 0 is the left edge. (This point remains fixed while the object changes size.) 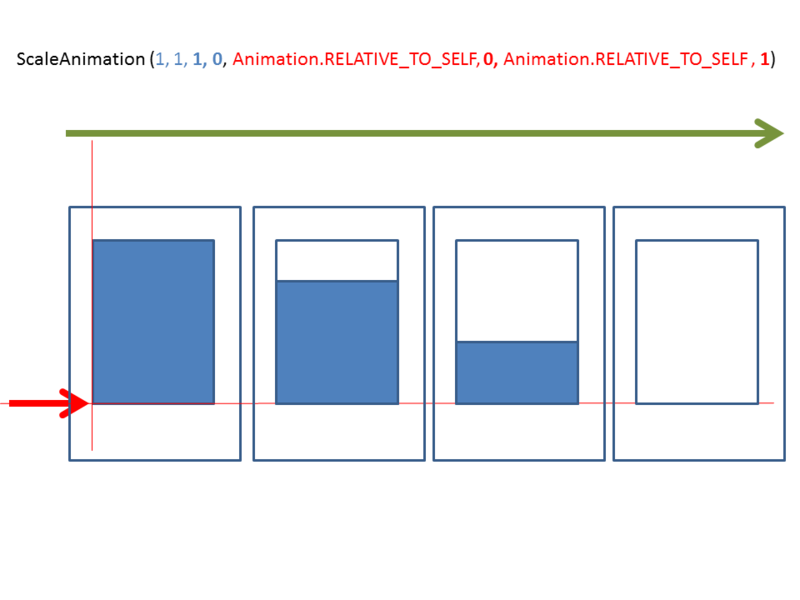 This value can either be an absolute number if pivotXTypeis ABSOLUTE, or a percentage (where 1.0 is 100%) otherwise. 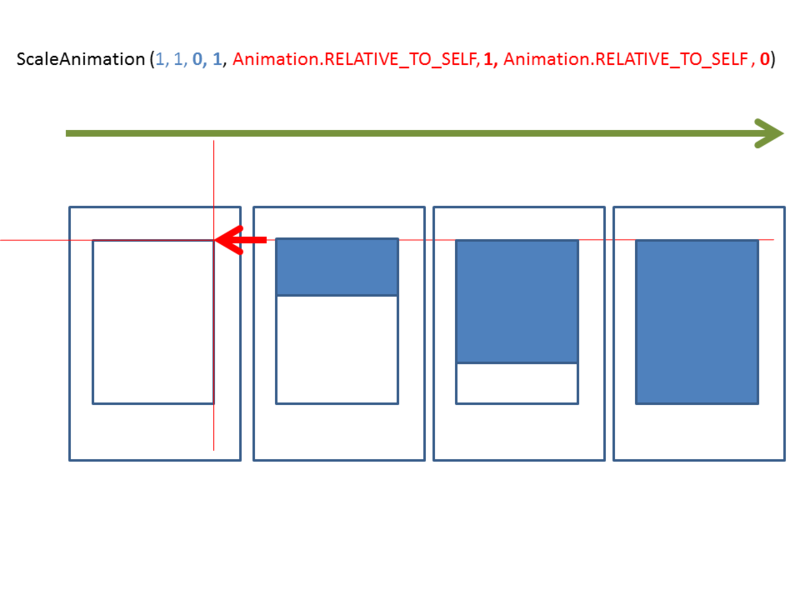 pivotYType Specifies how pivotYValue should be interpreted. 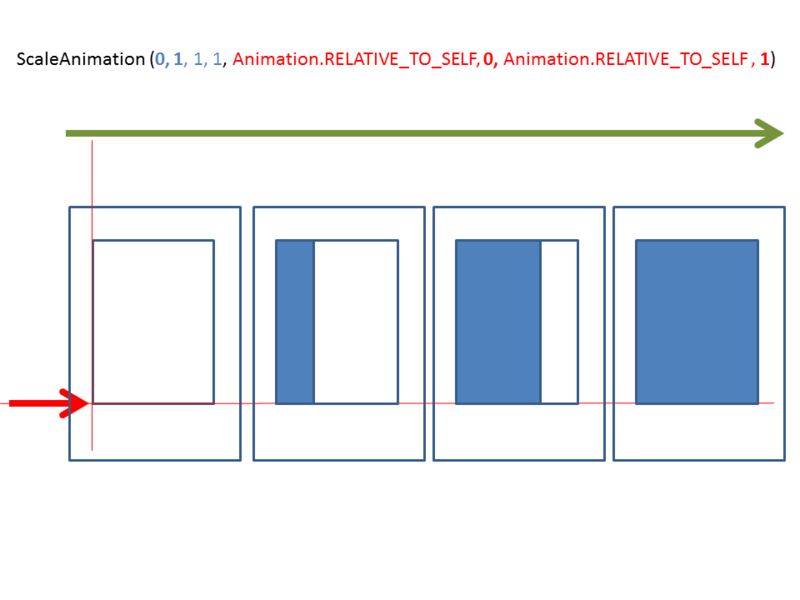 One of Animation.ABSOLUTE, Animation.RELATIVE_TO_SELF, or Animation.RELATIVE_TO_PARENT. 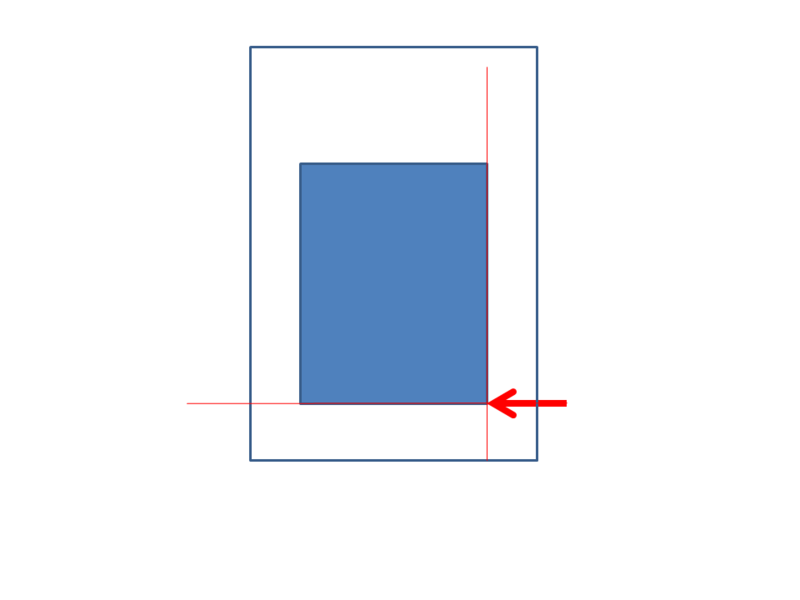 pivotYValue The Y coordinate of the point about which the object is being scaled, specified as an absolute number where 0 is the top edge. (This point remains fixed while the object changes size.) 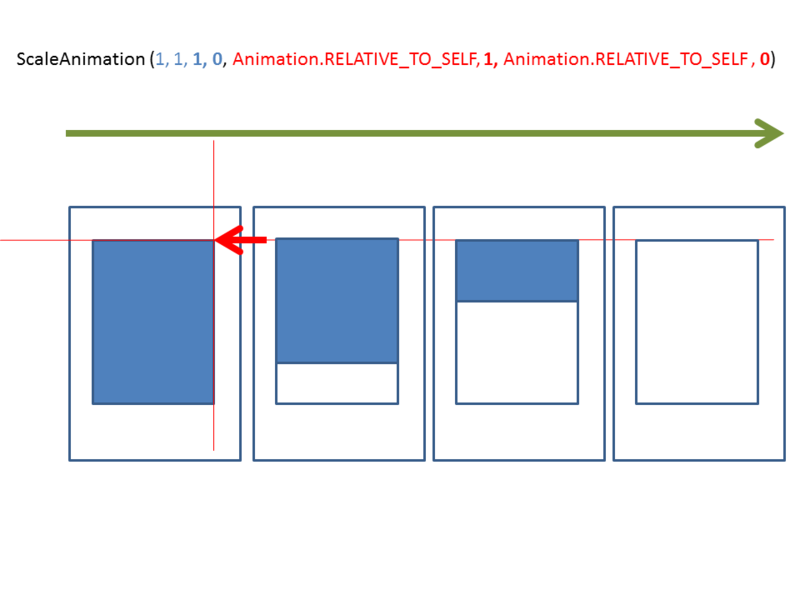 This value can either be an absolute number if pivotYType is ABSOLUTE, or a percentage (where 1.0 is 100%) otherwise. 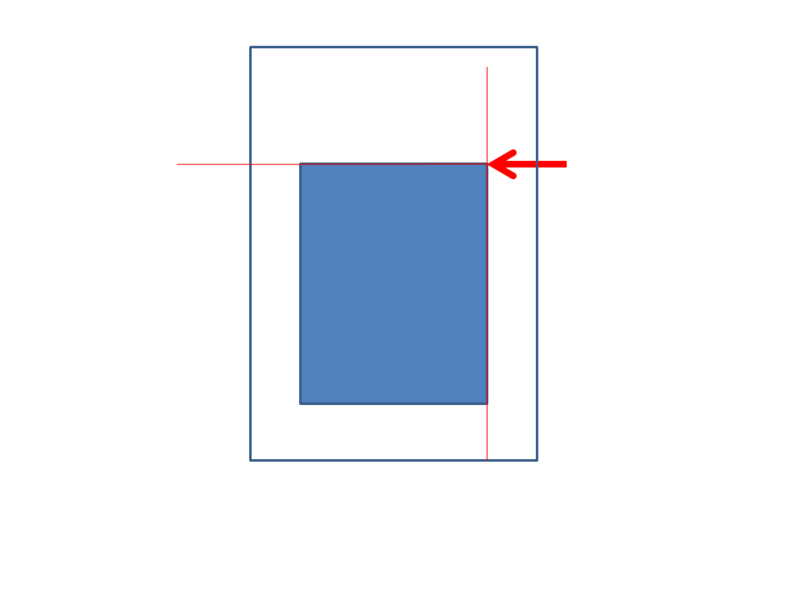 pivotXValue – 0 means left edge of the view. 1 means right edge of the view. Let us now understand from and to parameters. 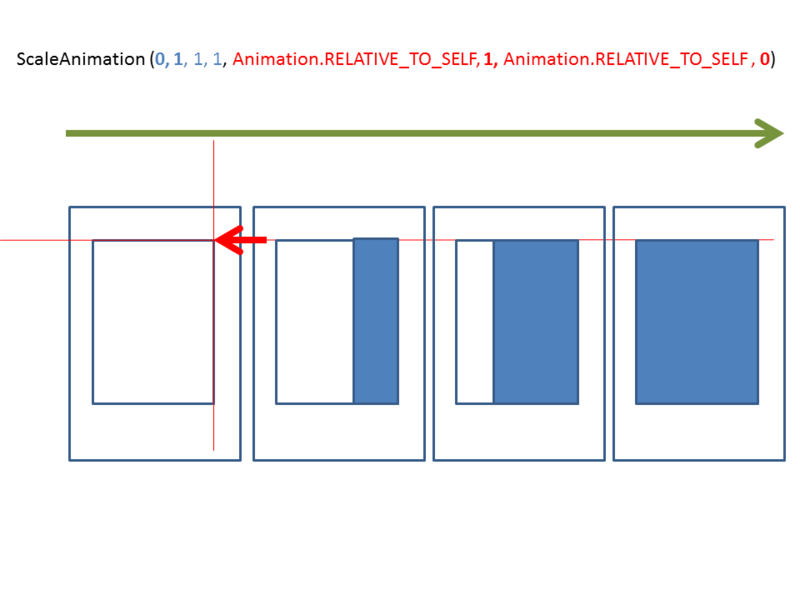 They represent the increase in size over x axis and y axis around pivot (Lines in the above diagrams). They are mentioned in factors ( Basically a ratio). 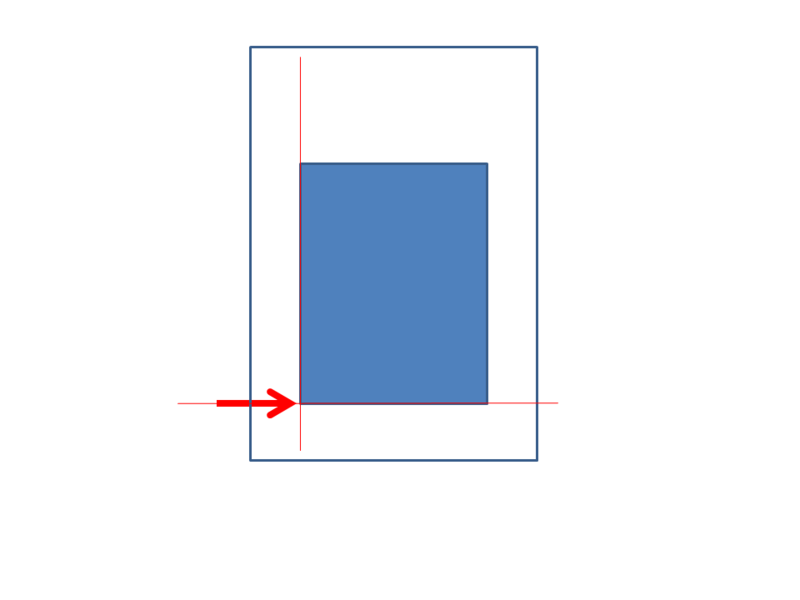 0 means 0 width or height, 1 means original width or height.